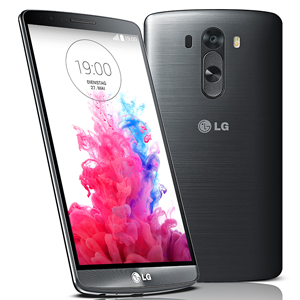 The LG G3 is the 2014 successor to the popular LG G2 flagship device. The G3 retains styling elements of the G2, but improves on internal hardware and screen size. The display is a 5.5" QHD IPS LCD with a resolution of 1440x2560. The device is powered by a 2.5GHz Qualcomm Snapdragon 801 processor, and 2GB or 3GB of RAM depending on the model. Internal storage is available in either 16GB or 32GB. The G3 also features a 13MP camera, with "laser autofocus", giving it a claimed fastest autofocus time of any smartphone. The exterior features a scratch-resistant metallic polycarbonate finish. All this is backed up by an impressive 3000mAh battery.